Shipping has been understandably wary in its embracing of IT. The attraction of reduced costs, increased efficiency and improved com- munications has been weighed up against ensuring security and reliability in an industry where a technical problem can leave ships stranded and delayed - costing thousands. Addressing the industry's frequently asked technology questions are the aim of the Com- munications and IT in Shipping (CITIS) confer- ence. Scheduled for March 29-31 at the Lon- don headquarters of Inmarsat, CITIS offers three days of informative and most important- ly, interactive, discussions on all areas of infor- mation technology in shipping. For more infor- mation call +44 (0)171 453 5492. PCs and Windows CE Palm Top computers that use C-Map — one of the world's largest sup- pliers of vectored electronic charts. Currently offering products for both the recreational and commercial markets, Chartwork software pro- vides all the conventional functions present in a chart plotter, while instilling a touch screen movement, fast redraw and simple editing. Technical consulting firm Greco Technologies has introduced it newest product — Argosoft — specifically developed for the moving and shipping industry. Based in Pasadena, Calif., the company's new product allows moving and shipping and companies to rapidly track jobs from an initial job estimate to the actual billing of the client. According to Greg Chun, Argo's president, "The program utilizes graphics to interface with the user rather than text as in older systems. This makes it easier to learn and use." U.S. on February 9. Bolero.net will provide the infrastructure to facilitate and increase interna- tional transactions by offering a platform for importers, exporters, shipping organizations and financial institutions. This addresses the key challenge of international business-to-busi- ness e-commerce, ensuring that exporters receive their payment and that importers are granted the goods for which they have paid. In tying its eight diverse facilities together with a state-of-the-art information system, Bollinger Ship- yards plans to recoup monetary and efficiency rewards far exceeding the $2.5 million investment. 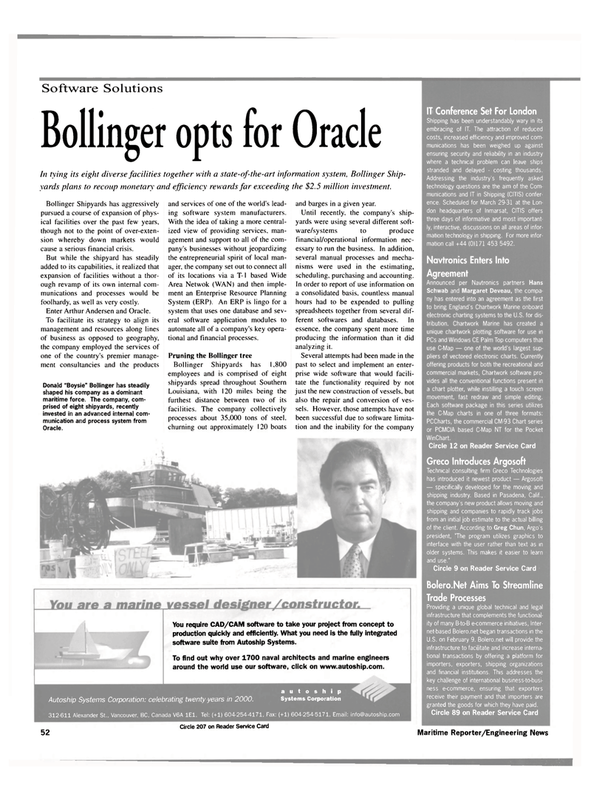 Bollinger Shipyards has aggressively pursued a course of expansion of phys- ical facilities over the past few years, though not to the point of over-exten- sion whereby down markets would cause a serious financial crisis. But while the shipyard has steadily added to its capabilities, it realized that expansion of facilities without a thor- ough revamp of its own internal com- munications and processes would be foolhardy, as well as very costly. Oracle. and services of one of the world's lead- ing software system manufacturers. System (ERP). An ERP is lingo for a system that uses one database and sev- eral software application modules to automate all of a company's key opera- tional and financial processes. Louisiana, with 120 miles being the furthest distance between two of its facilities. The company collectively processes about 35,000 tons of steel, churning out approximately 120 boats and barges in a given year. Until recently, the company's ship- yards were using several different soft- ware/systems to produce financial/operational information nec- essary to run the business. In addition, several manual processes and mecha- nisms were used in the estimating, scheduling, purchasing and accounting. In order to report of use information on a consolidated basis, countless manual hours had to be expended to pulling spreadsheets together from several dif- ferent softwares and databases. In essence, the company spent more time producing the information than it did analyzing it. You require CAD/CAM software to take your project from concept to production quickly and efficiently. What you need is the fully integrated software suite from Autoship Systems. To find out why over 1700 naval architects and marine engineers around the world use our software, click on www.autoship.com.